The 17th Kuching Intercultural Mooncake Festival (KIMF) will take place from September 17 to 24, from 6.30 pm to 11pm along Carpenter Street and Ewe Hai street in Downtown Kuching. The KIMF brings together participants from all races, cultures and walks of life to celebrate the Mid-Autumn Festival, with many non-Chinese locals not only joining in as audiences and patrons, but as vendors and competition participants, showing Sarawak’s inherent multicultural nature. 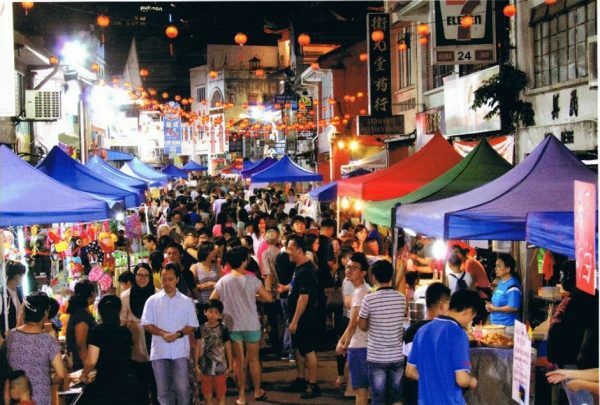 The Festival features food, music and cultural performances along a lantern-lit scenic street, one of Kuching’s oldest streets. There will be a lantern-making competition for the KIMF at Plaza Merdeka Shopping Mall on September 17, and the participants’ creations will be displayed as decorations for the duration of the festival. For more information on the lantern competition read here..
For updates on the festival, follow the event page here.